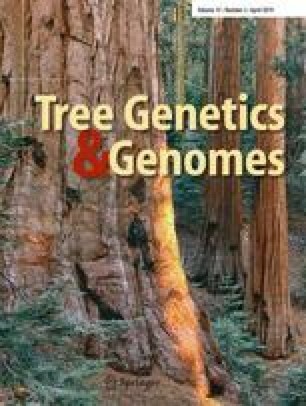 Triploid breeding via the fusion of 2n gametes and n gametes is an efficient method for breeding new varieties in woody plants. Triploid plants are frequently observed in the seedlings of the diploid rubber clone GT1. However, the factors affecting the occurrence and source of triploid progeny in GT1 are still unknown. In this study, the correlation between temperature and triploid progeny frequency in GT1 in different environments over 6 years was analyzed to evaluate the influence of temperature on the frequency of 2n female gametes. A total of 76 triploid progenies were analyzed using 19 simple sequence repeat markers, with the aim of revealing their genetic origin and the mechanism underlying 2n megagametophyte formation. The results showed that low temperature increased the frequency of triploid progeny in GT1, and the determination of allelic status revealed that all triploids were derived from the 2n female gametes, thereby confirming that low temperature increased the frequency of 2n female gametes. The rate of maternal heterozygosity restitution (HR) of seven loci varied from 2.70 to 67.65% with a mean value of 40.56%, and the rate of maternal HR of 37 triploids varied from 14.29 to 66.67% with a mean value of 41.38%, indicating that the production of 2n eggs in the triploid seedlings of GT1 was by second division restitution. The results of this study are valuable for the polyploid breeding of rubber trees. The online version of this article ( https://doi.org/10.1007/s11295-019-1330-0) contains supplementary material, which is available to authorized users. We would like to acknowledge the members of our laboratories for advice. We thank the Yunnan Institute of Tropical Crops, Dehong Institute of Tropical Agricultural Sciences of Yunnan Province and Comprehensive Service Center of Mengla Farm, State Farms Bureau of Yunnan, for collecting the plant material and for additional help. We thank LetPub (www.letpub.com) for its linguistic assistance during the preparation of this manuscript. SSR markers used in this study are from the published papers (Souza et al. 2009; An et al. 2009, 2013; Triwitayakorn et al. 2011; Li et al. 2012). Information about of all the applied SSR markers is available in Table 2. The data of triploid frequency for Jinghong2010 and Jinghong2012 were referenced from the literature (Zhang 2013), which are available in CNKI (http://cnki.net/). Conceived and designed the experiments: Yuan-yuan Zhang, Wei-guo Li; performed the experiments: Yuan-yuan Zhang, Xiao-fei Zhang, Xiao Huang; contributed materials/analysis tools: Yuan-yuan Zhang, Peng-Qiang Yao; wrote the paper: Yuan-yuan Zhang. This research was funded by Hainan Provincial Department of Science and Technology (317281) and Central Public-interest Scientific Institution Basal Research Fund for Chinese Academy of Tropical Agricultural Sciences (No. 1630022017010).